The fossil record is full of gaps. This is because only a minor portion of life on Earth died in the right conditions to become a fossil. We, as paleontologists, work with the information we have to understand what Earth was like millions of years ago. We always hope to find new fossils that help fill in these gaps and give us a better understanding of past Earth, life, and time. In early April (2016), a [study] was published describing a spider fossil from France. This fossil was preserved in a concretion (a hard mass formed by the build up of sediment) of siderite (a mix of iron and carbonate). This type of preservation is great because it perfectly preserves the animal. Left – fossil. Right – 3D reconstruction of fossil. Spiders are famous for making webs out of silk. This silk is released, or extruded, from tiny spigots on the underside of the spider. These spigots are clumped together and are controlled by spinnerets in true spiders (the group Araneae). Spinnerets help control where the silk is going, and make building webs a lot easier. Solid line – spinneret, dashed line – spigot. You can see the spider pulling the silk out of its spinnerets with its legs. 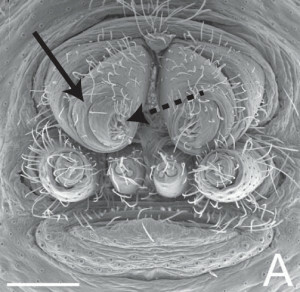 This animal, named Idmonarachne brasieri, was found to have silk spigots but not spinnerets. This combination makes Idmonarachne not a true spider, but very close (like a close cousin), and helps fill in gaps in our knowledge about the evolution of spiders. This entry was posted in English and tagged fossil record, France, Idmonarachne brasieri, spider. Bookmark the permalink.